The stage was set with two staircases, an arched door and a stone slab. The back lighting was red. For those who know Macbeth, the meaning was clear: blood. 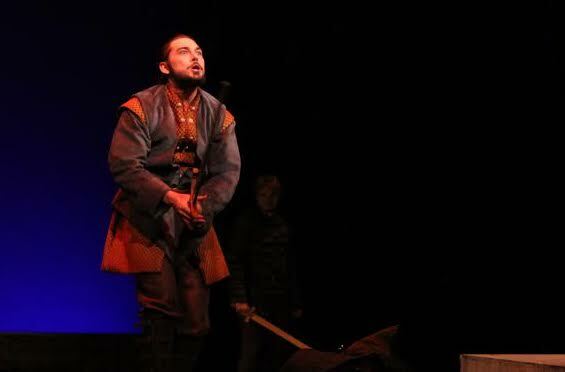 The Department of Speech, Theater and Dance presented Charles Marowitz’s A Macbeth in Falk Theatre on March 22-25. This adaption of Macbeth relied on the audience’s prior knowledge of the play, as it presented events out of order and mixed the dialogue between characters. The rendition cut away at the story’s exposition and started right in the action, never slowing down until curtain. Under the direction of adjunct theater professor Rosemary Orlando, the UT actors and actresses put their own spin on the adaptation. Early productions of the play had 13 witches and two Lady Macbeths, whereas UT’s production had a much more manageable cast of only three witches and one Lady Macbeth. Macbeth himself had three incarnations, who are introduced in the playbill as “second Macbeth and third Macbeth who serve to intensify his desires and fears while blurring the line between madness and sanity,” which the production certainly succeeded in doing. The constant moving in time, the audible voices in Macbeth’s head, the constant interjections of the witches and the bloody ghosts all worked to disorient the audience, leaving them to ask what is real and what is imagined – just as Macbeth does. This portrayal of the tragic figure was more compelling for me than the original; although his motives seemed less clear. This has to do with the presentation of the events; where in Shakespeare’s we watch Macbeth descend into madness, in this production Macbeth is already mad at the beginning. Macbeth is onstage screaming at the very start, and only has one scene of complete lucidity in the entire play. The three Macbeth characters were an interesting concept, but their meaning was uncertain for me. At some points in the play, it seemed as though only the first Macbeth could hear them, but at others they interacted with other characters. At other points in the play they were acting out roles that were not Macbeth’s, mainly guards, which left me confused about their purpose in the play. Chris McCoy, a senior musical theater major and the first Macbeth said that the other Macbeths were Macbeth’s conflicting personalities, akin to the devil and angel on a shoulder. These personalities were blended together in McCoy’s Macbeth through his stylistic character choices which borrowed from the other actors portrayals. Aside from having three Macbeths, losing several characters and shuffling scenes around; the biggest change from the original were the witches, or the weird sisters. The witches are onstage for almost the whole play with an ingrained role in Macbeth’s court, and they end the play with the lines that opened the original. While it’s interesting to have more of the witches throughout, it also changes the interpretation of the play. As the witches actively influence events, they even provide Macbeth with the knife used to kill Duncan. It is almost as if he is their puppet; they torment him, as much or more than Lady Macbeth does, guiding him to certain choices. Macbeth still chooses to kill Duncan, but with the witches a constant presence, Macbeth’s choices lose their agency as the witches direct the events. This choice certainly makes Macbeth more sympathetic, but it changes the narrative from a human one to a supernatural one. Every actor in the production was superb. Given the fast pace, the tension was always high and the burden of maintaining this fell on the actors. The play could have flagged easily if one person lagged behind the high tension and acted with urgency to compensate, but instead the actors moved the play along to its dramatic conclusion smoothly, leaving the audience breathless. McCoy was a compelling and moving Macbeth. He perfectly portrayed the stress Macbeth was under, from the alter egos and everyone around Macbeth telling him what to do, and his eventual cracking through his outbursts, facial expressions and movements. It could have easily been overdone and the serious tone would have been lost, but instead the audience was given a window into the mind of a person breaking down. UT’s students put on a fabulous production by making this story their own. Through emotive acting they gave a fresh take on an old story, and their performance promises that the rest of the season will be just as engaging. Two more productions are set for this semester: Stardust running from April 22-25 and Gender/ Schmender on April 27 at Sykes Chapel.